VANCOUVER - The mayor of British Columbia's most populous city is making his fight against Kinder Morgan's oil pipeline expansion a key plank of his re-election campaign. 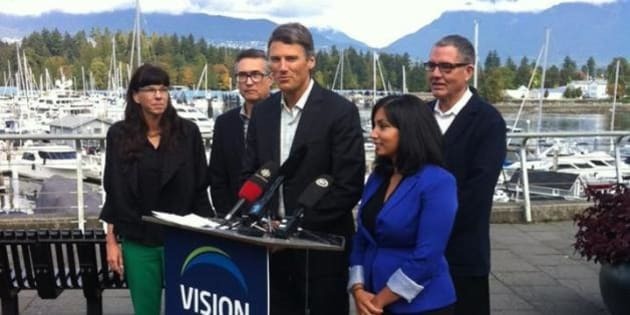 British Columbia municipalities go to the polls on Nov. 15 and Vancouver Mayor Gregor Robertson and his Vision Vancouver party released an environmental platform Sunday that makes the Trans Mountain expansion proposal its top priority. "Mayor Robertson and Vision will continue to say a loud, firm `No' to the federal government and Kinder Morgan, and speak up for Vancouver in the National Energy Board hearings," Robertson and his party colleagues said in a statement. The $5.4-billion project would almost triple the capacity of the current pipeline linking the Alberta oilsands to Port Metro Vancouver, increasing flow from 300,000 barrels of oil a day to almost 900,000. His main rival for the city's top job — former journalist Kirk LaPointe, running under the Non-Partisan Association banner — has not taken a position on the project but has criticized Robertson for declaring opposition before a National Energy Board review is complete. "With 40 days to the election, the NPA are still silent on Kinder Morgan, a project that threatens to wipe out the environmental progress we’ve made," Robertson said. "The risk from an oil spill, even a minor one, would have a significant impact on Vancouver’s economy and our environment. Our economic advantage is Vancouver’s pristine natural environment." The pipeline expansion proposed by the Texas-based pipeline giant puts that at risk with no benefit to Vancouver, he said. LaPointe said Sunday that the regulatory review for the project is barely underway. "Gregor Robertson and Vision Vancouver's rigid ideology have hamstrung our economy. 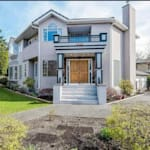 He is ashamed of our economy, and that has contributed to Vancouver having the lowest family income growth of major Canadian cities," he said in a statement. LaPointe borrowed a phrase from the federal Conservative stance, promising "responsible economic development" for the city. "Gregor Robertson and Vision Vancouver's rigid ideology have hamstrung our economy," said LaPointe. With Robertson at the helm, the city has asked the Federal Court of Appeal for a judicial review of the federal energy regulator's process, saying the National Energy Board is refusing to consider Trans Mountain's impact on global climate change. The existing 1,200-kilometre Trans Mountain pipeline has linked Alberta's oil sands to the West Coast since 1953. The company's Westridge marine terminal currently handles about five tankers a month. The expanded pipeline would result in about 34 tankers a month, and it would be capable of carrying diluted bitumen, the heavy, molasses-like oil that pipeline opponents say will sink if spilled in the ocean. In neighbouring Burnaby, where Kinder Morgan was fined for a 2007 construction accident along the pipeline that rained 230,000 litres of oil down on a neighbourhood, the city is also vehemently opposed to the project and has refused the company access to city lands for survey work. The dispute with Burnaby has set the regulatory review back seven months. A final report from the National Energy Board to cabinet is now due Jan. 25, 2016.